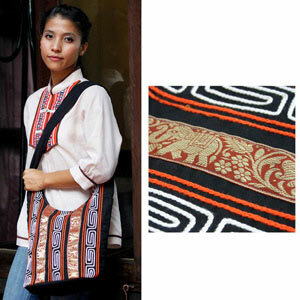 The bags artisans of northern Thailand handcraft this shoulder bag with cotton and polyester. They complement the labyrinthine motifs with elephants and flowers woven into golden ribbons. 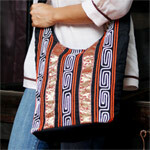 The bag is fully lined with cotton and it features two inner pockets. It closes with a zipper. Materials: 95% cotton 5% polyester. Lining 100% cotton.